How many hours do you spend looking for files? I am so tired of looking for screenshots that are called ‘Capture.jpg’ or documents I have saved in iPages called ‘Blank’. I’m making a concerted effort to name everything – and I mean everything – appropriately. 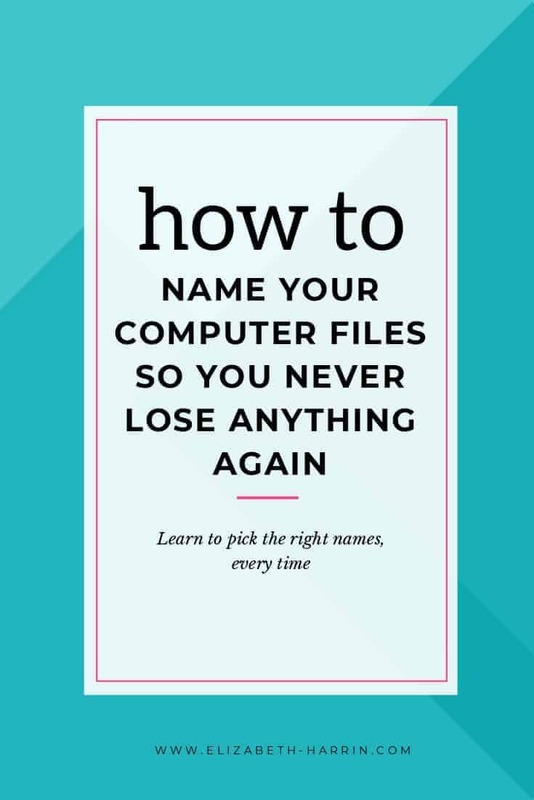 Naming files is something that is very important if you ever want to be able to find them again. That’s the primary reason for choosing descriptive file names. You absolutely want to be able to lay your hands on a file when you look for it next time. Because opening images just to check if they are what you think they are is a waste of time! Be more organised: choose decent file names for your documents, images, videos, screenshots, pins and everything! In this short video, I share some tips for creating file names that you won’t forget. Learn how to give your files descriptive, helpful file names so you can easily find them again when you need them. Includes short video with file naming tips. Enjoy!